Linked Notes and Deposits, Constant Proportion Portfolios, Derivative and Financial Products and More. The A' Structured Product Design Award is a design competition open to submission of structured product designs by financial institutions worldwide. Submissions are accepted from banks, credit unions and financial service companies. 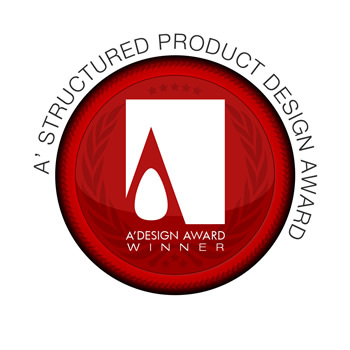 The A' Design Award for Structured Product is not just an award, it is the indicator of quality and perfection in design, the award is recognized worldwide and takes the attention of design oriented companies, professionals and interest groups. This is a concealed award category; in order to protect the trade secrets, classified and confidential information regarding the entries, results will not be published online. For the open / published award category, refer to Banking and Financial Products Design Award. The winners of the A' Spatial Design Award can opt-in for having their entries made visible and results published but this also requires approval from us. Please remember that we do not publish the PDF docs submitted in any case, therefore any confidential information shall be provided part of the PDF. The PDF files are open to viewing of jury members only, and are not send to press or not included as a part of our PR Campaigns. A1. Even though the structured product design category is concealed entry due to trade secrets, the entries could potentially be visible online. Especially the following could potentially be visible to public: “Project name, category name, primary function, designer name, and small thumbnail image”. When submitting to the Structured Product Design Competition keep in mind that your submission will be evaluated on multiple dimensions, your design is judged together with its communication design together with its structure and complexity. The best structured designs are considered for their degree of innovation, human factors, ease of implementation and realization, depthness of development, and overall value generation. Furthermore, the communication campaign, advertisements and visuals will be considered part of the product and will be evaluated. Unlike other awards, you are not obliged to make any further fees for winning the award and everything listed in the winners benefits will be provided free of charge. To apply to Structured Product Design Award category, simply register, login and upload your design regularly and choose Spatial Design Award Category from the category list during nomination. Remember to ensure to choose the Cat. 109 which is the concealed category. Learn more about the winners' benefits here. Award winners will be able to use a title that matches their nomination category: Such as "Financial Products Design Award Winner". Previous winners for the Structured Products Design category are not publicly displayed, however further information and press kits could be available upon demand to press members and interested parties, please contact us for press kits in this category. Furthermore validation service is possible to confirm award status and qualification; please contact us to verify if a service or product is indeed a winner of the Structured Products Design Award. Main Image* 3600 x 3600 pixels JPEG The logo of the structured product on white background, sized at 65 to 85 % of the canvas depending on available margins. Optional Image #1 1800 x 1800 pixels JPEG A conceptual photograph, a stock image photograph or illustrative image that could be used by press members to represent the product. Optional Image #2 1800 x 1800 pixels JPEG Another conceptual photograph, a stock image photograph or illustrative image that could be used by press members to represent the product. Optional Image #3 1800 x 1800 pixels JPEG Graphics, visuals, illustrations or other images demonstrating the performance, difference or unique aspects of product, or an extra photo. Optional Image #4 1800 x 1800 pixels JPEG Product presentation graphics or conceptual photograph or stock image that could be used by press members to represent the product. Video File Max. 10 MB. 45 Sec. AVI Conceptual Video, Short Feature or Advertisement of the Product if any, could include performance reports, presentation, history etc.